For most of my life, I have considered myself an athlete of caring degrees. During High School, I played several sports, stayed active in college and started running marathons and half marathons to stay in shape. An active lifestyle was part of my daily routine until November 2010, when I suffered a traumatic fracture in my ankle from falling off a ladder. The doctors said that this injury was life changing and my active life would end. I attempted to return to normal life, but could not from the overwhelming pain in my ankle. For six years after my injury, I sat around, watching TV, and attempted exercise but never succeeded. In Fall 2016, I was fitted with a new device for my ankle that removed the pressure and pain there. For the first time in six years, there was hope of being active again. I was unsure how to proceed as it had been so long since I was able to work out. My sister-in-law was in amazing shape from working out at CrossFit West Nashville, so I gave the coaches there a shot at guiding me back, and I am so glad I did. The first day that I walked into CrossFit West Nashville, I attended my CrossFit 101 Class. As I waited for the session to begin, I watched the people who were participating in the current CrossFit class, and all around me people were jumping, sweating, and individually lifting more weight than I had in my entire life. I thought there was never any way I could do this. The one that that gave me hope wasn't how hard everyone was working, or the exercises they were performing, but the way that everyone was encouraging each other through the workout. It was electric, and at that moment, I thought, just maybe, this could be the place for me. I am writing this testimony one year since my first day at CrossFit West Nashville and in many, many ways, my life has changed for the better. I am stronger, faster still working on being thinner, but definitely healthier. Haha. I contribute this to waking up every day before the sun rises, gathering with the folks who attend the 5 am class and simply doing the work. The coaches motivate me in every class to work harder than the day before and push me to achieve new goals. It's amazing that only a year earlier, I thought the man I used to be was lost forever, until I came here. Jeanine has been going to CrossFit West Nashville since spring 2014. "I had done CrossFit in the past, and when I moved to Nashville from Canada, I knew that I needed to find a new box to continue my workouts, but also find a way to meet people and connect to a community." She found CrossFit West Nashville online, emailed John, and went in for the CrossFit 101 session. "I enjoyed the one on one session and was confident that John loved what he did, and knew what he was talking about. I didn't even have to try out another box; from the first class I knew I was in the right place." Jeanine continued to be a regular at CrossFit West Nashville attending 3-5 days per week. "I loved going, seeing myself improve, learning new skills and being a part of a community." Then, Jeanine and her husband decided it was time to start a family. "I've been into health and wellbeing most of my life, and knew that I wanted to be as healthy as I could during my pregnancy and for my unborn child." Jeanine continued to attend CrossFit while pregnant. She worked with the coaches and listened to her body for how to modify the workouts appropriately. "The coaches were really helpful showing me modifications for exercises and were very supportive of me. I was able to continue doing CrossFit four days before my due date and going into labor." Jeanine was able to have a natural childbirth without medication and attributes regular exercise as a reason why that happened. "I had an amazing birth experience and I believe that staying healthy and active, but not overdoing it and staying safe, really helped me have the birth that I wanted to." 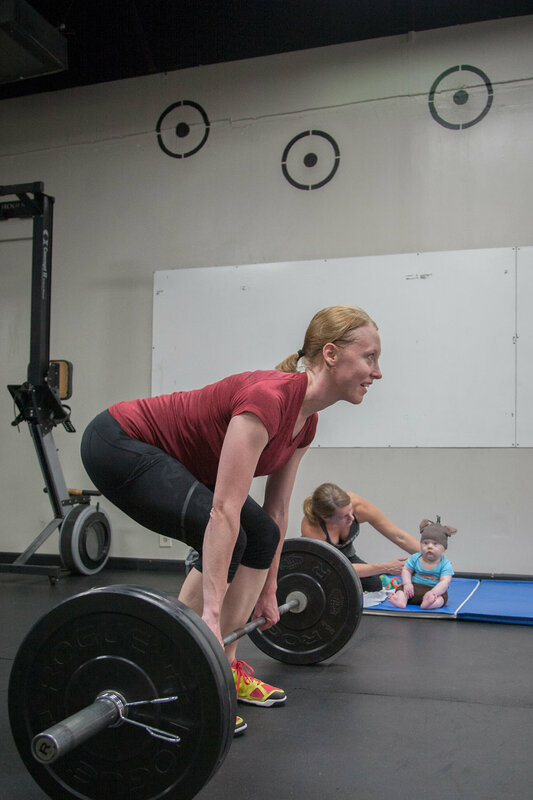 Jeanine was able to come back to CrossFit four weeks after giving birth. "I started things up slowly, and started back to exercise once my body was ready, which is really important and different for every mother." One of the best things about coming back to CrossFit was the coaches and members and how supportive they are. "Coach Stephanie even holds my son Adrian when I come in for a workout! It is amazing that I can come back in for a workout and bring Adrian with me; I don't have to worry about daycare or having someone watch him. This allows me to take time for myself to be healthy so I can be the best mom, wife and person that I can be. I am so thankful for all of the staff and members at CrossFit West Nashville for being such a pillar in the community and for allowing me to continue to workout, even with an infant." Jeanine continues to attend regular CrossFit classes and is sure that Adrian will be a CrossFit Kids member in the future! Leah has a warm smile and after a few minutes of talking to her, you have the feeling you’ve known her for years. Only when she starts to walk with slow, exaggerated steps do you realize there is something about her that’s out of the ordinary. Leah has cerebral palsy. Cerebral palsy is a disorder of movement, muscle tone or posture that is caused by an insult to the immature, developing brain, most often before birth. Although born three months premature, Leah doesn’t know the exact cause of the cerebral palsy that affects her lower body. Then in October of 2013 she came across an article about Stephanie Hammerman, the first certified CrossFit trainer with cerebral palsy. “I thought, ‘If she can do it, I can do it.’” Leah said. So she emailed John Kennedy, the owner of CrossFit West Nashville, attached a link to Steph Hammerman’s article, and told him she wanted to try CrossFit. She was also surprised at how much she enjoyed working out in a group. “I love the support. And everyone has to scale the workout, so I’m no different than anyone else.” Because of the tightness in her calves, Leah has trouble with squats and movements like box jumps. “The coaches show me how I can scale those things, and I can do them,” she said. It’s been nearly a year since Leah started CrossFit. With coaching and community, she has pushed herself past her initial expectations. Not only can she do CrossFit, she has found new strength within herself. Felicia sat in the CrossFit West Nashville parking lot and cried. She had just watched a small, blonde woman enter the gym with a full grocery bag in one arm and a squirming child in the other arm...all without breaking a sweat. Functional fitness, Felicia reminded herself. Her introductory CrossFit class was scheduled to start in a few minutes, but she just couldn’t make herself get out of the car. She called her husband Eric. Eric had joined CrossFit over three months ago as a way to regain his mobility after a severely herniated disc had nearly crippled him. Felicia had been wary of his decision. Everything she had read about CrossFit mentioned injury, cults and kool aid. But she couldn’t help seeing his progress as he moved easier and started losing weight. Felicia was an emotional eater - something she was able to keep in check until after her second pregnancy. “After a couple of years, I had to admit that it was no longer baby weight. It was just weight,” she said. Her demanding and sedentary desk job made eating regular and healthy meals difficult, and she soon slipped into a cycle of skipping meals completely then later binging on high-fat, processed foods. When a stranger asked a not-expecting Felicia when she was due, she knew she needed to make a change. Despite having bad knees from her time in the service, Felicia started getting up at 4:45am three days a week to work out with a personal trainer and became more mindful of her diet. But three months later she was frustrated at the lack of progress her efforts were producing. The next time Eric suggested she should try a class at CrossFit West Nashville, she agreed. The first class was hard. Her body was unaccustomed to the movements, and she felt awkward and self-conscious. Even the warm welcome she received from the other CrossFitters didn’t calm her nerves. But she kept trying, and she kept smiling, and she kept coming back. But one of Felicia’s proudest CrossFit moments didn’t happen in the box. While shopping at a local Reebok store, another CrossFitter talked Felicia into buying a purple racer-back tank. When she modeled the tank for Eric, he took a picture of her back. “Muscles! I have back muscles!” Felicia said.